At an early age I became aware of the affects that landscape can have on people. Growing up in central Illinois, I was surrounded by expansive highways, mowed turf lawns, and big box stores, sprawling out into the distance with little regard for the constantly changing natural landscape and the culture of the people it surrounded. As a child I sought escape from these orderly, monotonous surroundings and found refuge in the backyard of my childhood home, which was an overgrown assortment of edible and native plants. These childhood experiences made me realize my desire to alter the typical American landscape and I therefore became a Landscape Architect. After working for various environmental organizations focused on preservation and natural resource management I realized that the realm of Landscape Architecture is located at the intersection of nature and people and the goal of the profession is to sensitively link the two. As our environment continues to change due to an increase in CO2 emissions I have turned my focus onto the design of sustainable transportation networks, with the intent of enabling people to pick up their bikes, ditch their automobiles, and lower their carbon footprint. Katie Pitstick is a Designer at Durham, NC office. She has a Bachelor’s degree in Landscape Architecture and a minor in Urban Planning from the University of Illinois at Urbana-Champaign. 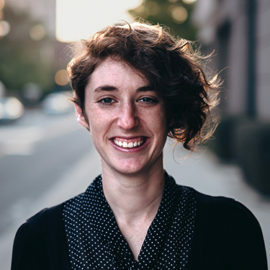 With five years of experience in environmental design and planning for a variety of different entities, including the federal government, local municipalities, and international non-profits she has gained experience in trail and green infrastructure design, construction documentation, project management, grant writing, and graphic representation. She has recently obtained her professional landscape architecture license in the state of Illinois.